This incredible idea is an extension of the pottery water cooling vessels used though the millennia. 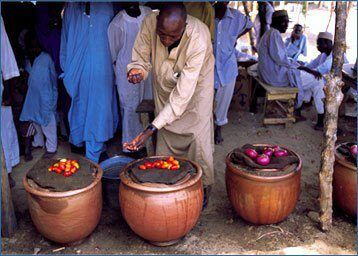 This is Mohammed Bah Abba’s Pot-in-Pot invention. In northern Nigeria, where Mohammed is from, over 90% of the villages have no electricity. His invention, which he won a Rolex Award for (and $100,000), is a refrigerator than runs without electricity. So, instead of perishable foods rotting after only three days, they can last up to three weeks. Obviously, this has the potential to change their lives. And it already has — there are more girls attending school, for example, as their families no longer need them to sell food in the market. Brilliant ideas don’t need to be difficult to execute: here’s a case in point. The technology has been known for centuries, but WASN’T APPLIED TO THE PROBLEM. Notice that applying technology also has the effect of educating young people.